Jenna Rabberman was out on a quick errand and was only minutes from home when the unthinkable happened. She had strapped her 6-week-old infant into his car seat and drove to pick up her 2-year-old from preschool. They were on their way home when she remembered that they would need milk. 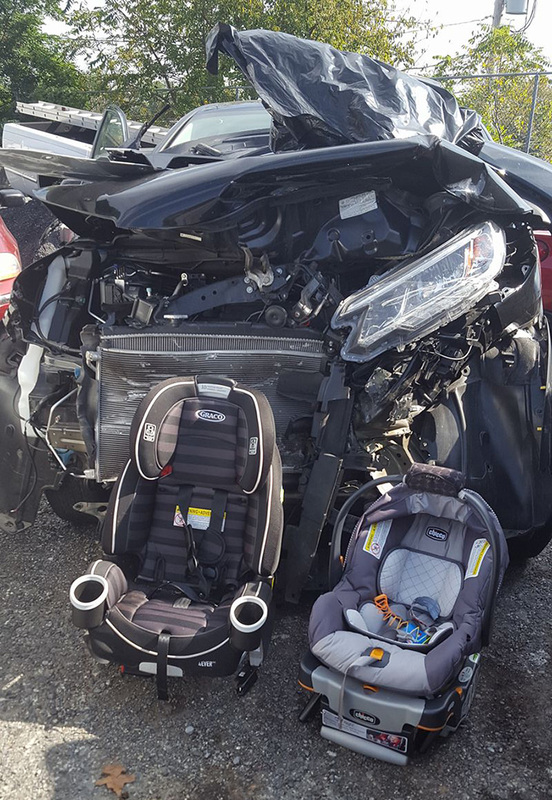 They were only a short drive away from home when another car slammed into them, totaling her 2015 Honda CRV and causing injuries to herself…but incredibly, not to her kids. She had taken the time to properly strap her children into their seats, double-checking that the straps were tight and placed over the boys’ chests before continuing on her way home. She normally doesn’t post public pictures on Facebook, but this one, she wrote, was important. THIS is why you buckle your kids into their car seats correctly every SINGLE time. Even when they scream because the straps are tight. Even when they complain about the chest clip or being rear facing…the paramedics told me it could have been very different had I not taken the extra 2 minutes to be sure they were buckled correctly.” She wrote. She was shaken and wanted to make sure that other parents realized how important it was to strap children in securely. She has already made plans to replace the car seats before taking her children anywhere else, and hopes that more people will see just how important it is to pay attention to details.